Before I get the obvious questions I will answer this question first…. Why this recipe is called blue pudding…. It’s not blue nor is it pudding! Explain! Well you are right it’s not blue nor is it pudding. 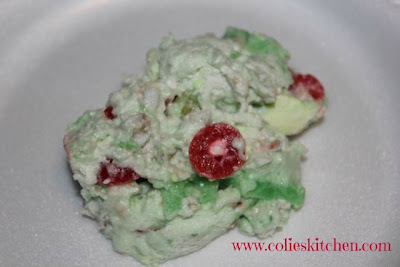 I think the recipe is actually what would be called ambrosia salad. This recipe was made by my great aunt Fern for Christmas when my Mom was a child in the 1950’s and 1960’s my great aunts father called it Blue Pudding and the name stuck. Blue Pudding is the only name this recipe has ever had to my knowledge and my Mom’s knowledge as well. We had it with our Christmas dinner this year for the first time ever and I fell in LOVE with it. It’s so easy to make and it taste soooo good! I love the creaminess, the texture, and the random flavors and more than anything I love the Christmas colors. Next add marshmallows and allow them to melt also. They may not melt a lot either. Next add Jell-O to the water/marshmallow mixture and mix well. Stir until it begins to cool. Add drained pineapple, cherries, and nuts then mix well. Place in the refrigerator until it begins to congeal. While the Jell-O is congealing in a separate bowl or in a mixer bowl add heavy whipping cream and begin beating either by hand or using a mixer until the creamy turns into whip cream with stiff peaks.